2017 Wireless Carrier Speed Test Battle Time: Let’s See Those Screenshots! 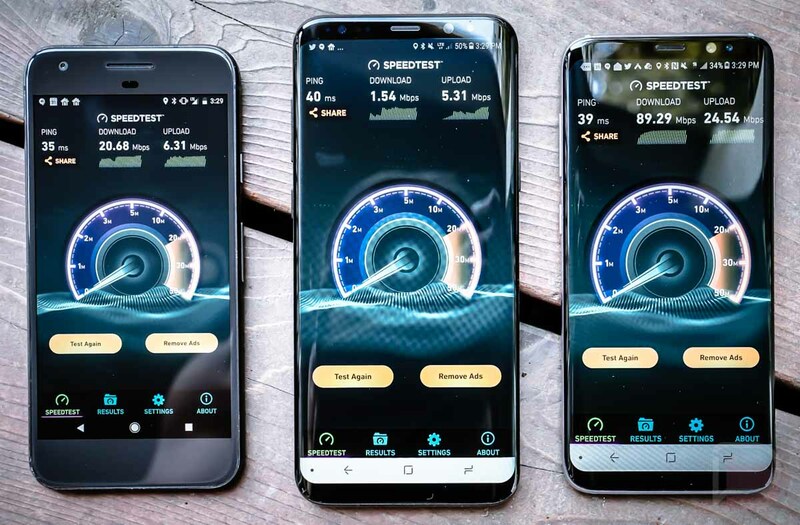 With so much talk these days about wireless network speeds and companies like Verizon trying to hit those 1Gb downloads, it seemed like a nice time to open up a speed test battle. I don’t think we’ve done one of these in a good 3 or 4 years for some reason (since Verizon launched XLTE), and maybe that’s because everyone’s network started catching up to each other. But now that there seems to be a new focus on who the fastest wireless carrier is, this could be fun. So, like we used to do, all you need to do is jump off WiFi, attach to your wireless network and run a speed test with Ookla’s Speedtest.net app. Once done, screenshot it and head into the comments to attach it to a comment. Be sure to tell us which carrier you are on as well. What good is a speed test battle if we don’t know which carrier only gave you 2Mbps down on? We need to know who to point the finger at while laughing. For those curious, the three phones above are attached to AT&T, Verizon, and T-Mobile (in that order). I just ran those tests simultaneously moments ago. I really do live in the Verizon Black Hole of Signal Death. Go easy on them.